On our trip to Thailand, we spent some time biking up north between Chiang Mai and Chiang Rai. For two days of our bike trip, we rode along the Thai-Burmese border. It's amazing how you can see into one country from the other - they essentially share a big plot of land - and yet, the topography changes when you cross over. The ride reminded me of a trip I took to Amman, Jordan, while I was living in Jerusalem. The two cities are probably only 50 miles apart, and at that latitude, there isn't even a river separating Jordan from Israel. And yet, where Jerusalem has rolling hills, Amman's main highway runs along a straight cliff. Apparently, the foods of Thailand and Burma are like the topographies: similar, but also quite different. I've been working my way through Naomi Duguid's wonderful new cookbook, Burma, for the past couple of weeks. Before these peas, I hadn't cooked anything from it, but I've been reading it in bits and pieces, and her stories and recipes are really beautiful. The balance of spicy, sour, and salty flavors in each dish recalls Thai food, but from what I can tell, Burmese cooking is less sweet, possibly spicier, and perhaps slightly funkier as well. Many of the recipes call for things I don't stock in my kitchen, like dried anchovy powder and preserved soybean disks. But Duguid lists substitutions (fish sauce, miso) where they work, which makes the book more accessible. We had a couple family friends of D's in town last weekend. Their sons are both chefs, so they know from good food. I decided it was the perfect time to take Burma out for a ride. Okay, so I was noncommittal at first. 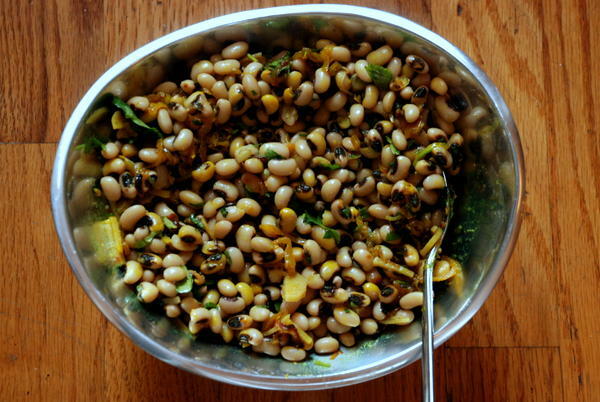 I started out with these black-eyed peas, figuring if they didn't turn out to be special, I could take the meal in a different direction. But the peas, quite simply, blew me away. The recipe is called "Peas for many occasions," and Duguid says she makes them in large batches and freezes them for quick meals later. I can see why: the peas are cooked simply, then seasoned just before serving, so the flavors really pop. Once the peas are done, pretty much all that's between them and the table is a quick saute of shallots and tumeric and a squeeze of lime. Confident in Burmese food's deliciousness, I dug deeper into Duguid's cookbook, seeking another recipe for Friday night dinner. I settled on a simple but memorable fish curry, which I'll be posting later in the week. Dinner was curry, the peas, some plain rice, and asparagus roasted with sesame oil and salt. It's a meal I'll definitely be making regularly. If I'd had more time, I might have tried my hand at one of the many condiments Duguid shares in the back of the book. Some are marinated salads, others quick pickles, others spicy, sour pastes. All look amazing. Since apparently I'm on a south/southeast Asian kick, I'll tell you about one other recipe on my very-shortlist: mango with sticky rice. Champagne mangos were at the grocery store yesterday, and I'm now the proud owner of a bamboo steamer. I'll let you know when I take that on. For now, I'm going to heat up some fish curry. Notes: This recipe calls for fish sauce. You can replace it with soy sauce, but add only half the amount upfront, and taste to see if your beans need the extra teaspoon. Also, I loved the beans just as Duguid made them, but I found that a couple teaspoons of maple syrup really pushed them over the edge. Feel free to skip it, as it's not in the original recipe. Drain the peas and put in a medium pot with the water, the 1 chopped shallot, and the minced ginger. Do not add salt. Bring to a vigorous boil, then reduce the heat to low, cover the pot, and simmer the peas for 1 1/2 to 2 hours, until tender. Check periodically to make sure there's enough water in the pot; add more if the water gets low. When the peas are tender, drain them and transfer them to a medium bowl. About 10 minutes before the peas are done, heat the peanut oil in a small sauté pan over medium-high heat. Add tumeric and the 1/4 cup sliced shallot, and cook, stirring occasionally, until shallot is soft and browned, 3-4 minutes. 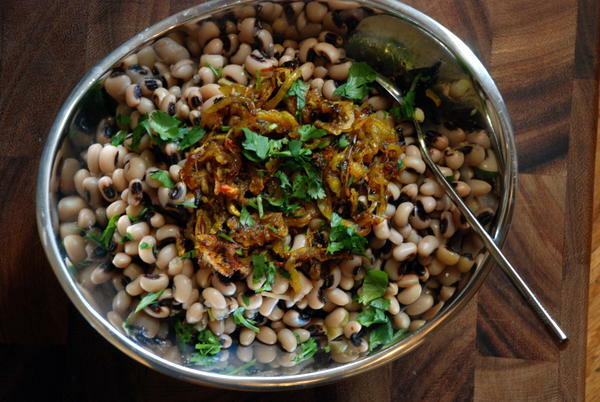 If planning to serve now, add the tumeric-shallot mixture to the beans and toss. If serving later, keep the shallot mixture separate (or just plunk it on top of the peas but don't mix it in).